A first attempt at gardening! 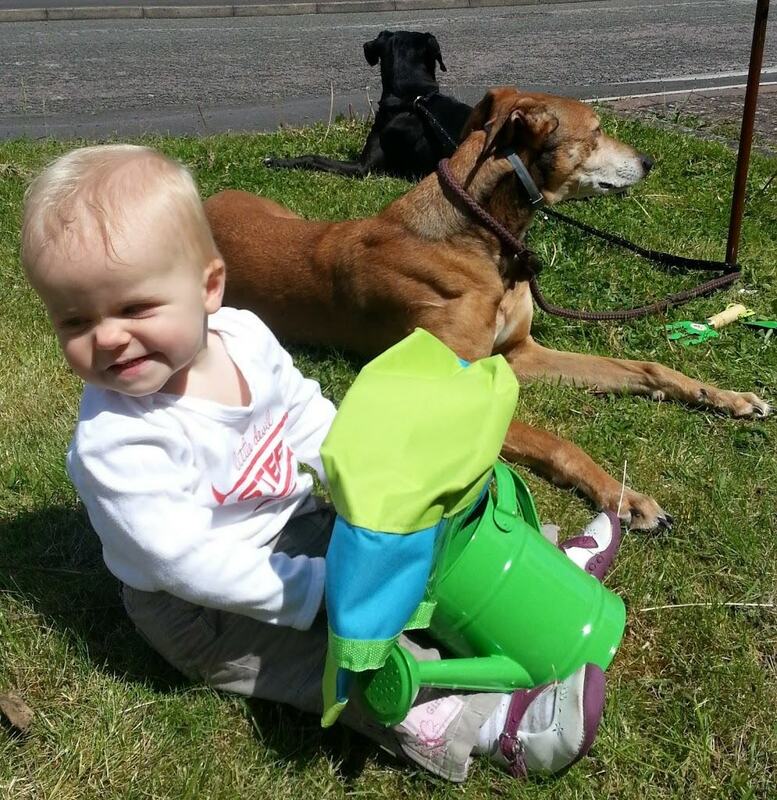 Libby and I are lucky enough to be taking part in the MoneySupermarket #KidsGrowWild challenge. To be honest, I’d forgotten that I had applied to do it so the knock on the door yesterday delivering our parcel was a nice surprise. It was an even nicer surprise when we opened the parcel and found Libby’s beautiful gardening bag inside. Libby is obsessed with bags, so having her own was a bit of a dream come true. Particularly as it contained some more lovely goodies. She has a little watering can, some lovely flower seeds, a trowel, a fork and some gardening gloves that will be great for a few years time when her hands have grown a little bit. Here she is having a look through the bag. I am in the process of tidying up our garden, and I’ve started with the front garden and cut back the overgrown plants and weeded the flower beds. This has left a nice little area in the flower bed that was empty. I decided that for Libby’s first attempt at growing flowers, we would use the ‘pretty flower family’ seeds and sew them in an “L” shape. On the seed packet, it suggested sewing the seeds in the shape of your name. We didn’t have quite enough space for this, but I thought it was a lovely idea and hopefully, next summer Libby will be learning her letters so seeing the letter “L” for Libby in the garden should be quite exciting. 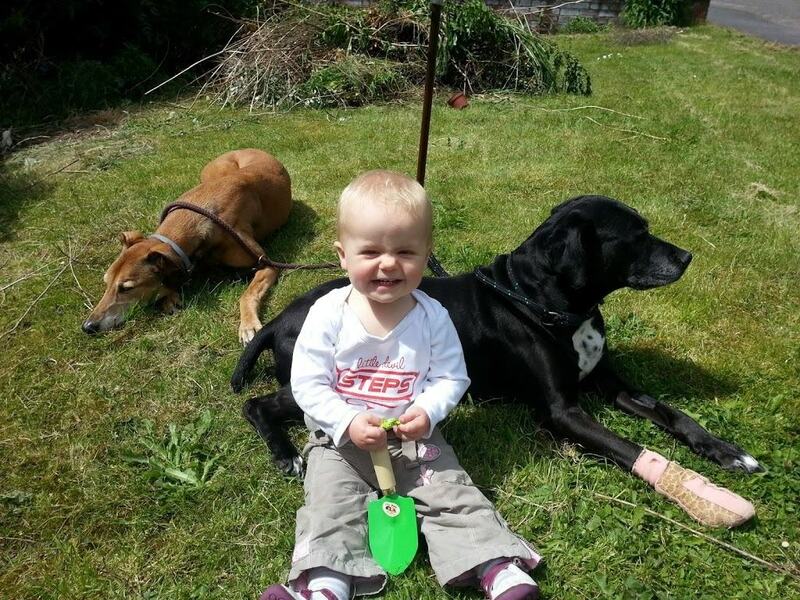 While I prepared the ground, Libby checked out the trowel… and it seems she loved it! Then I helped her to sew the seeds in an ‘L’ shape, and we covered them up with some dirt. Next, she used her fabulous little watering can to give the seeds a bit of water. 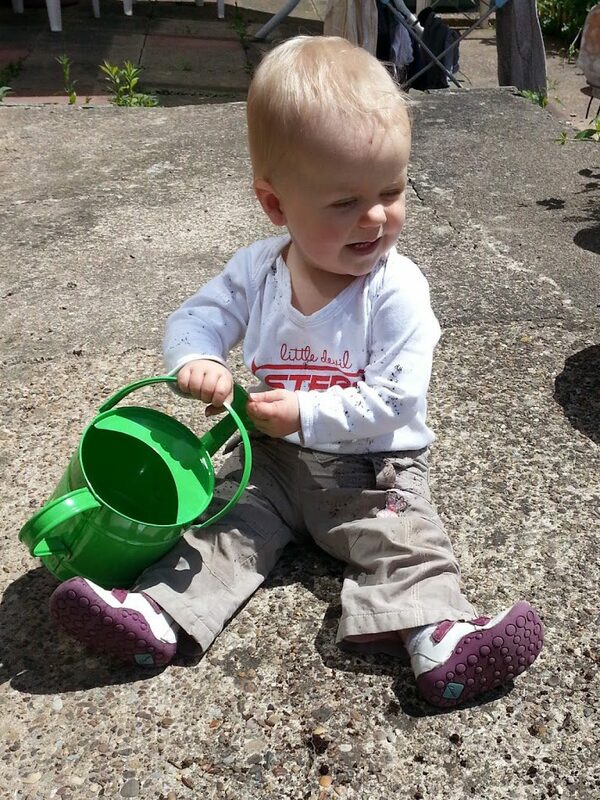 Then we went into the back garden… still clutching the watering can that she adores! In the back garden, my borders aren’t quite ready for growing flowers yet so I decided that we would plant one of the sunflower seeds that Libby received in her gardening pack into a big pot. This will go against a the wall, where there is a lovely sun-trap. I hope it will grow well there, I don’t think it will be long before it towers over Libby. 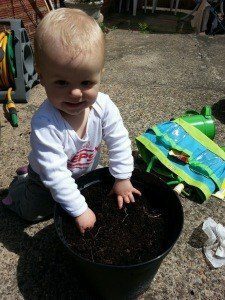 She was delighted by the idea of planting in a pot, because it meant that she could play with the dirt before we put the seed in, covered it over and gave it some water. 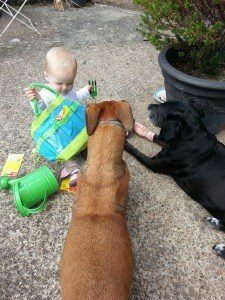 Before we headed inside for a much needed bath, Libby explained to the dogs how much she loves her beautiful gardening kit. As you might have noticed, our black dog Soxa has a bad paw at the moment so our family walks have had to stop for a few days. Spending time in the garden has been a welcome replacement for our walks and a great way for us all to enjoy the weather. This post is an entry for BritMums’ #KidsGrowWild Challenge. Lovely post hun. She looks like she had fun. Hope the dog gets better soon poor thing! By the way, you need to add a link to Money Supermarket as per the terms and conditions of this linky challenge for the entry to be valid. What a lovely post. She’s adorable and looks like having lots of fun! Good luck! Such adorable pictures! Now she’ll have green fingers for life. And the dogs enjoyed Libby’s explanation no doubt! Too cute a pic. Send Soxa my best wishes and an extra cuddle.